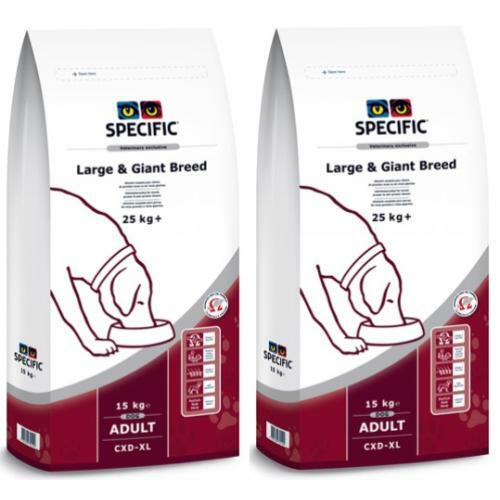 Specific CXD-XL Large & Giant Breed Adult Dog Food is a delicious kibble that's been designed been to meet the particular nutritional needs of large and giant breeds. Specific CXD-XL Large & Giant Breed Adult Dog Food contains high fibre levels and exceptionally digestible ingredients to help firm up the softer stools common amongst large and giant breeds and with extra-large kibble to encourage chewing. What's more, it's packed with high levels of Omega-3 from fish and other ingredients support healthy digestion and the immune system and with moderate energy levels to maintain an ideal bodyweight.An ideal food to support a healthy active life. Contains high levels of Omega-3 from fish for healthy coat, skin and joints. Helps to maintain ideal body weight – with moderate energy density and added L Carnitine – a fat burning amino acid that helps convert fat to energy. With added psyllium husk to absorb water so firming up stools and regulating the digestive tract. With rice and fish – highly digestible ingredients to reduce faecal output - that was the nicest way we could think of saying that. Rice, wheat, fish meal, maize protein, pork fat, hydrolysed poultry protein, fish oil, yeast (including source of beta-1,3/1,6-glucans), minerals, eggs, powdered cellulose, vitamins and trace elements, psyllium husk, lysine, methionine, threonine, tryptophan, L-carnitine. Antioxidants: EC approved additives: BHA, BHT, propyl gallate. It contains no artificial colours or flavourings.